As I have described in my last post I stared my work with Oracle VM 3.1 but after all problems with NFS local storage I installed Oracle VM 3.0. When storage issues have been resolved it was a good time run and share information about upgrade process from version 3.0.3 to 3.1. Process itself has been split into two phases - Oracle VM upgrade and Oracle VM Manager upgrade. Oracle VM upgrade is straight forward procedure. I have booted my server from new 3.1 CD and chose upgrade option. After couple of minutes and one reboot new version was in place. Unfortunately repository based on OCFS was not mounted and none of my virtual machines started. But before I dig into it I decided to upgrade Oracle VM Manager. You can download upgrade ISO image from e-delivery (V32481-01) and it has only 123 MB in size. In next step ISO image has to be mounted using loop device and upgrade script should be started. Using /tmp/workdir.MdYTjS6054 for backup and export location. Backup of Oracle VM Manager repository failed ... Exiting upgrade process. Using /tmp/workdir.RLGCBY8025 for backup and export location. This time it finish with successfully and I was able to login to Oracle VM Manager. My first impression after login to upgraded system was that none of two OCFS file systems have been mounted. I checked system logs and looked around in system and I found that only one iSCSI target has been presented. New version of VM means new kernel and new configuration for multipath daemon. In my case second HDD (/dev/sdb) which I used as a block device to my local iSCSI server has been configured with multi path access and I had to change my iSCSI server configuration - instead of using direct path to /dev/sdb2 I need to use path presented through device mapper. When I found out what is a mapper name for my device I have changed tgtd configuration and rebooted server. I helped and now it least cluster heartbeat file system has been mounted but still no repository. Solution has simple but it took me some time to find it out. I need to rescan all disks in Storage section of Oracle VM Manager and acknowledge all events in Repository section. Event view and acknowledge of all previous errors helps in some stages and made a clean view of current state of Oracle VM. Thanks to Yury Velikanov posts about Oracle VM Server I start my journey with that tool. First of all installation and configuration of Oracle VM 3.1 and Oracle VM Manager on one box went well and I was able to connect to it via browser (see Yury's posts for details). I have started configuration of environment but there was first glitch. Oracle VM can create local storage on whole disk only (correct me if I’m wrong) but I have installed it on my test PC already running other Linux distributions. I had 1 partition free (not whole disk) and I was unable to add it in simple way. So far so good I was able to add local NFS server as repository for Oracle VM but in next 5 min I hit another issue – you can import Assemblies (pre-configured machines) via http(s)/ftp protocol only. OK – lets add Apache to Oracle VM. I have already added yum repository from OEL 5.8(thanks Yury !) so adding httpd package was simple. That was simple as well and I was ready for implementation of Virtual Machine. I started to importing assemblies using local http server (http://localhost/OVM_OL6U1_x86_64_PVM.ova ) but it hung after minute or so. I wait a while but nothing happen so I start digging. First of all there was no disk activity at all – hmmm – I know it quite well – D-state. Jun  4 13:24:21 OVMiddleearth kernel: INFO: task nfsd:3639 blocked for more than 120 seconds. Jun  4 13:24:21 OVMiddleearth kernel: "echo 0 > /proc/sys/kernel/hung_task_timeout_secs" disables this message. Oops looks like problem with kernel / xen stack. My first idea was to google for error but only a few pages were found. Oracle VM 3.1 is latest version and it is using Oracle kernel as well so I decided to reinstall everything thing using Oracle VM 3.0.3 and test it again. 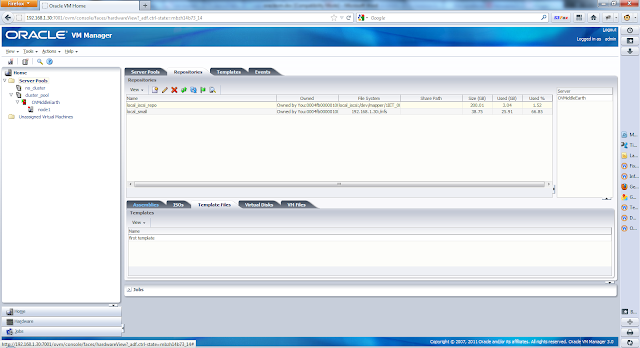 After 1 h I have my Oracle VM 3.0.3 up and running and I was ready for tests. This time I was able to go one step more. I was able to import assemblies into Oracle VM but it hung when I started create template process. Jun  4 15:23:21 OVMiddleEarth kernel: [  361.219126] INFO: task nfsd:6446 blocked for more than 120 seconds. Jun  4 15:23:21 OVMiddleEarth kernel: [  361.219127] "echo 0 > /proc/sys/kernel/hung_task_timeout_secs" disables this message. There were similar errors in /var/log/message file so this same issue appear in two different kernels so probably kernel version is not a problem. This time there were direct relations to network so I think for while and I decided to check network stack – and it was it – network parameters in kernel were set to defaults so I set number of parameters. [root@OVMiddleEarth ~]# tshark -r lo.trc | grep -e "^52." So it looks like that NFS connection is terminated when any other packages from Oracle VM Manager or local Oracle XE database are appear on loop back interface. Probably (I can’t prove that so far) missing ACK is a part of problem but why [nfsd] is hanging on writing on disk ? Anyway I still want to test Oracle VM so I decided to use iSCSI on loopback instead of NFS. Now it is time to add some block devices to share. We need at least two – as one has to be used as voting disk for OCFS2 and other one will be used for keeping data. TGT (iSCSI server) is quite flexible so we can use file on file system presented as block device. When both LUN(s) have been presented to Oracle VM I have created server pool (it has to be clustered one even for one server - still not sure why but I was unable to create OCFS repository for not clustered server pool). Then I have created repository and was able to import Assemblies and create template without any issues. Creating my first VM from template was possible as well and at the end I have my first Oracle VM machine.